HARRISBURG, PA--(Marketwired - Oct 8, 2013) - Committing to run in a half-marathon is not for everyone. The sun, the crowds and, of course, the actual running part may be fun to watch, but most people would rather curl up on the couch than pound the pavement during the weekend. So what does it take to draw racers, volunteers and spectators into the glorious outdoors for a 13.1-mile race on October 20, 2013? For TownePlace Suites Harrisburg Hershey, it's quite simply the call to help. Benefitting Children's Miracle Network and Penn State Hershey Children's Hospital, the Hershey Half Marathon begins at Hersheypark Stadium and winds through the tantalizing landmarks of Hersheytown and Chocolate Town, U.S.A. While the setting is sweeter than most marathon locales, it's the cause that inspired six staff members from this family hotel near Hershey, Pennsylvania to volunteer their time to set up and facilitate the marathon. Volunteers and racers alike will receive complimentary passes to Hersheypark's attractions for future visits, but the real reward is in knowing that the money raised will directly benefit the kids in their communities. "TownePlace Suites Harrisburg Hershey has built its reputation on superior service and strong community partnerships," said General Manager Bobbi Carey. "Volunteering for the Hershey Half Marathon to benefit the children in our neighborhoods is a natural extension of our ethos." As one of the finest extended-stay hotels in Harrisburg, this property offers guests an ideal location between downtown Harrisburg and Hershey, Pennsylvania. 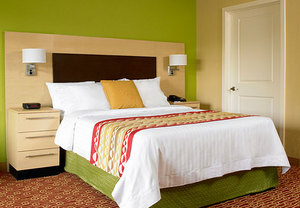 And with spacious suites, complimentary breakfasts and free Internet, it stands out among other hotels near Hersheypark as having some of the sweetest deals around. For volunteers, racers and spectators this October, that might just be the perfect combination of virtues to turn a good cause into a great vacation. Located near the chocolaty sights of Hershey, Pennsylvania, TownePlace Suites Harrisburg Hershey offers its own sweet deal to travelers. The 107 suites are bigger, brighter and better than those of other hotels, and they accommodate families as easily as business travelers. Complimentary Internet and continental breakfast add value to every stay, while fully-equipped kitchens and a pet-friendly policy mean guests can make themselves at home in these extended-stay accommodations. Four floor plans, flat-screen televisions and, beyond the suites, a fitness center and indoor pool all combine for a hotel that is as welcoming as it is relaxing. The staff members, renowned for their friendliness, are happy to help guests find their way to all the local attractions, from Gettysburg, to Hersheypark, to Carlisle Car Shows. Or, if guests want to venture further afield, day trips to Philadelphia, Baltimore and Washington, D.C. are easy to make from these comfortable and service-oriented Harrisburg suites. Benefitting Children’s Miracle Network and Penn State Hershey Children’s Hospital, the Hershey Half Marathon begins at Hersheypark Stadium and winds through the tantalizing landmarks of Hersheytown and Chocolate Town, U.S.A.